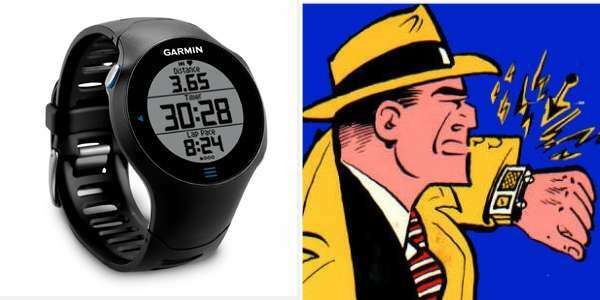 Feelin' Mo' Kenyan: Garmin 305 - R.I.P. My Garmin Forerunner 305 died the other day. Basically it says it's charged, but if I turn it on, it only stays on for about 3 minutes, then shuts off. No low battery warning, nothing. Tried resetting it and searching on the web. Basically, nothing worked. The last few days have been kind of strange, not knowing exactly my pace, mileage, etc. Not that I need all that for every run - but the Garmin is just so darn convenient and useful. I use it all the time. It helps me manage pacing, keeps track of my splits and has found me back to the hotel when I'm traveling, lost in a neighborhood, and desperately need to get back for a morning meeting! Last night at the track I was going to do my workout by feel. Then Maureen assigned it and it was 800 (hard) right into 1600 at 1/2 marathon pace and then back into 800 (hard) with 4x200m at the end to work on form when tired. I groaned because I knew I'd over-run the 1600m coming off a fast 800m - and the whole point was pacing practice. So I went to the car and put on my dress watch. It worked, but I probably looked even funnier with a stainless steel band watch running around the track. And I kept reaching down to my wrist to 'lap' the watch... and it has no such buttons. So I ended up just tapping the glass. There was something comforting and ritualistic about that. Funny. I pulled some stats on it from Training Center. I don't really look back at past runs that often, but whenever I hook up the Garmin to my computer to charge, it downloads the runs - so I have a catalog of all the runs I've done while wearing it. 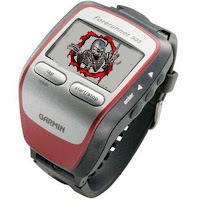 It said that I first used the unit in November of 2008 and that I've run about 5600 miles with it strapped to my wrist. That's pretty good mileage I guess for under three years of running. Also considering that I don't always wear it for recovery runs. Granted it's been through sweat, snow, rain, cold, heat, etc.. but I thought it should have lasted longer. But the 610 with the HR monitor costs about $400 bucks. The 305 is $138 on Amazon. At $138, that's like 2 cents a mile if this one lives as long. The 610 is 7 cents a mile. That's an extra $2.50 a week on my schedule. So, yeahhhhhh... I pulled the trigger on a replacement 305. I'm OK with looking a little dorky to save some dough. New one arrives today. Hope it lasts longer! !